Back in 2012, roughly 15-20% of airport website traffic was coming from smartphones and tablets. In 2013 I watched it move to around 25%. Now it’s well over 50%. That’s no surprise, people pull out their phone when they travel, not their PC. In 2015 and again in 2016 I compared 100 major global airport websites to see how many of them were mobile friendly. These airports range from serving 2 million to over 90 million passengers a year. 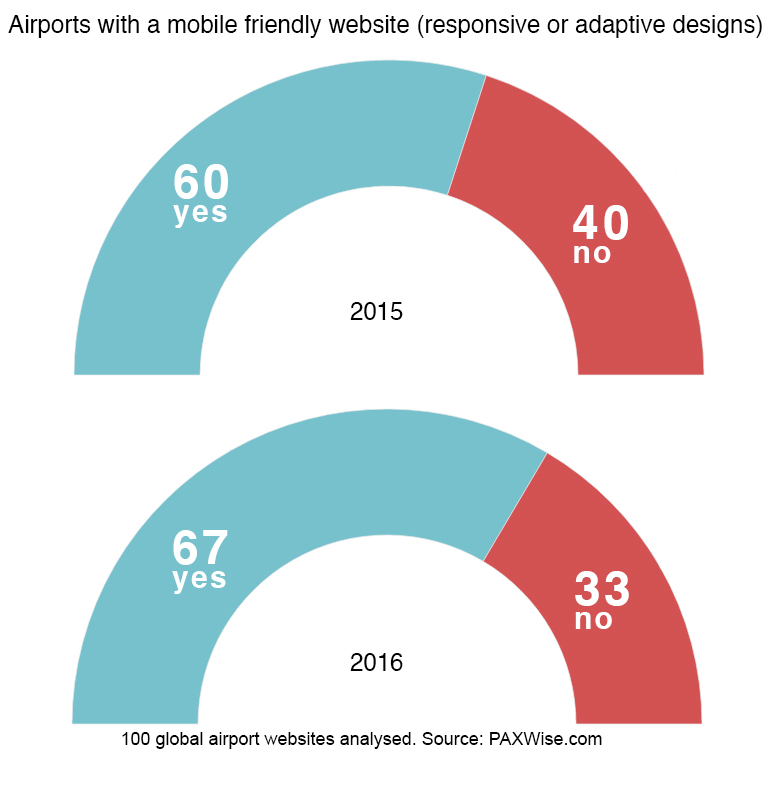 60 of the airports had a mobile friendly website in 2015 and that grew to 67 in 2016. 33 still have a website that is impossible or close-to-impossible to use on a smartphone. And of those that were ‘mobile friendly’, many were still painfully difficult to use. It’s one thing to be mobile friendly, but it’s another to be traveller friendly. Having a mobile friendly website solves one part of the puzzle but making it work for customers who are on the move is another. Wondering whether it’s smaller airports that are more likely to be at fault? I found it was more common for those serving 30 to 50 million passengers a year to not have one (17 of 25 didn’t). Of the 20 airports that serve over 50 million passengers per year, 8 did not have a mobile friendly website (including the 3 busiest on my list). Smaller airports scored better. 16 of the 21 airports that served under 10 million passengers a year had a mobile friendly website. How easy is your website for your customers to use? 0 Comments on "The website mistake 33% of airports are making that drives travellers nuts"